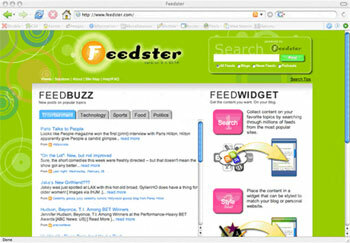 Feed-based search service Feedster has announced a “Web 2.0” style makeover for its site. To start with the obvious, the site looks completely different. When comparing the old with the new, it‚Äôs quite apparent that we decided to keep only the name from the old design. Everything else we set aside, in favor of our newer, shinier self. They’ve also announced a custom widget that lets you embed channels of information into other sites. The widget can be customized to coordinate better with your site. There‚Äôs another big change that may not be as obvious‚Ä¶ A few weeks ago, we quietly released a new semantics-based search engine. Any Feedster search is now algorithmically focused on producing meaningful results, effectively limiting spam. Feedster provides real-time search and other services based on RSS feeds from blogs, podcasts and news sources.